Last week had me both at the Alice Hoffman Young Writers Retreat at Adelphi University in Garden City, New York, as well as in Austin, Texas for the CantoMundo conference. It’s a little more rocknroll that I’m used to, but I had a blast! Here’s a pic of one of the nice surprises from last week: a collection of personal notes from the young writers I worked with at Adelphi. I can’t begin to express the gratitude I feel at being given the opportunity to share my work and talk poetry with others. Thank you to all who attended my talk on lyrical prose and who have since reached out since then! Keep the words coming, for yourself and for others! Each year, CantoMundo hosts a poetry workshop for Latina/o poets that provides a space for the creation, documentation, and critical analysis of Latina/o poetry. This year was the conference’s last time in Austin, and it was nothing short of spectacular! I was able to be in workshops led by Texas State Poet Laureate Carmen Tafolla one day, and one led by the current Poet Laureate of the United States, Juan Felipe Herrera. Both poets presented themselves as forces of nature as well as generous guides. Highlights included the readings on Friday and Saturday at the Spider House Ballroom. I read on Saturday, specifically “Drinking at Home” and “Directions” from Everything We Think We Hear. One of my favorite things to do at CantoMundo is to geek out about my favorite poems by the poets who wrote them and who happen to attend the conference. The poem below by José Antonio Rodriguez originally appeared in the February 2012 issue of Poetry magazine. I remember copying it out by hand at a bookstore and marveling at the raw imagery, from like a thousand ticks turning their backs to the “halos” at the end. What continues to move me even now in reading is how the imagery is packed with so much emotional resonance, pointing to things hidden as well as things almost there. for the same reason the light follows it. from the overgrown lot next door. without saints to weigh them down. p.s. 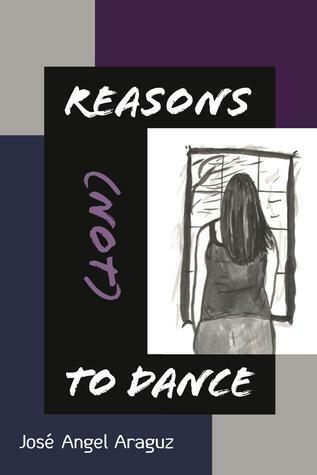 One week left to enter the Goodreads giveaway for Reasons (not) to Dance! Details below! This week, I had the opportunity to talk poetry at the Alice Hoffman Young Writers Retreat which is held at Adelphi University. We wrote about the moon a la William Stafford’s qoute, and used that exercise’s focus on performance and attention to talk about various approaches to lyrical prose. It was a great group who asked me questions ranging from what kind of sandwich I would be and why (the answer: French dip, because it’s a plain sandwich, just bread and meat, but it’s transformed in the eating, the dip into the au jus sauce before taking a bite making it a little funky, as I try to do to mine own plain words and self), to what role does place have in my process. The answer to this latter question is complicated. I mean, when by the mountains in New Mexico, my poems tried to stretch like a range across the horizon; when in NYC, my poems tried to match the heights of skyscrapers. But when it comes to my books, there’s a little bit of everywhere and everything in each. We carry our places with us as much as our stories. I thought of this as Rob Linne, who was kind enough to invite me to talk at the retreat, introduced me by saying that I was from Corpus Christi, calling the city one of his many hometowns. Something about that phrasing and sentiment continues to feel right to me days later. Much of the talk revolved around me reading poems from my book Everything We Think We Hear, and then tying in the little lessons each poem gave me as I worked towards a final draft, lessons about lyrical prose as much as life. One poem from the book I had planned to but didn’t get a chance to read is “Old Love.” This poem’s first draft came from a dream where I heard the final lines in my head and lived out the final image of talking into a baby carriage. I literally stumbled out of bed and those lines down, but it took a few years to really to where the poem wanted to go. While a lesson in waiting, this poem also became a lesson in honesty, which requires its own waiting sometimes. When I dream of an old love, I let it ride, having already broken off what connected us, and not wanting to go through it all again. I drink my coffee the way they would remember me taking it, for some light and sweet, for others black and with a comment on how I can’t believe how long it took me to take it this way, undiluted, untampered, bitter. With a heat on my tongue, I listen to old love, let my mind wander more than I did when I was with them, knowing I have had this conversation, feeling the answers give over as accommodating as leaves to sunlight. With a green on my tongue, I inevitably mix up the conversations: ask after the father of one whose father was never around; whisper an inside joke I realize too late I never shared. When old love looks at me lost, I ask, Where did you get those, and point sometimes to a set of bow and arrow earrings, sometimes a pair of toucans tattooed on the inside of an arm. Stories of boutiques I paced politely. Stories of a childhood fascination with colorful birds. Don’t you remember? When we run out of small talk, I find myself pushing a baby carriage in which old love has fallen in. Helpless, I look down, only to hear myself doing baby talk, shaking my head, waving my hands, emphatically repeating words, and, in general, speaking in such a way I know I cannot ever make myself understood. This weekend is CantoMundo. I’ll be participating in one of two CantoMundo readings in Austin, TX, details below. If you happen to be in town, stop on by – it promises to be a great time! I’ll be part of the group reading on Saturday. One of the highlights of teaching composition this summer has been engaging with excerpts from the anthology Beauty is a Verb: The New Poetry of Disability. There is a wealth of great poetry in this anthology, which includes the work of Ona Gritz, Hal Sirowitz, and the writer of this week’s poem, Jim Ferris. What I love about this week’s poem, “Poet of Cripples,” is how Ferris takes a singular experience and sings it in such a way that it becomes personal for the reader. The stakes engaged with via the poem quickly become familiar; the speaker’s intimate address of Look with care, look deep, is in the tradition of Whitman’s “Song of Myself.” Poetry becomes, for Ferris as it was for Whitman, a way to access our hidden void and push ourselves to what we would become. creating fresh swallows in my dreams. its movement is damp, decayed, final. Both poets meet at the place where language and the body meet to affect each other, like waves making and unmaking the shore. In the summer course I’m teaching, we have been discussing ideas of writing as performance; that is, what gets going as soon as words are on the page. It’s similar to what William Stafford means when he says, “The moon you are describing is the one you are creating,” which I wrote about in a post from this Spring. I came across this week’s poem, “The Joy of Writing” by Wislawa Szymborska, and share it here because of the connection it has to these concepts of writing as performance. From the beginning, the poem ties the act of writing to what’s being described, creating a singular conceit of “these written woods.” The metaphor is stretched enjoyably far. What I find most enjoyable of all, at least this week, is the startling nature of the last line: “Revenge of a mortal hand.” In contrast to the title of the poem which sets up low dramatic expectations, Szymborska takes us down to that last line with a sense of mortality and complication that is surprising as well as apt and necessary. * new poem up at cider press review! Just a quick post to announce the release of the latest issue of Cider Press Review which features my poem “Corpus Christi”! This particular poem was written during a summer over ten years ago where I lived in my hometown of Corpus Christi, Texas without A/C, which led to many hazy meditations at midnight. That this poem has finally seen the light of day is proof that poems, like roaches, are creatures of survival. This issue also features stellar work by Samantha Futhey, Gabrielle Campagnano, Lauren Camp, and Geoff Anderson among others. Check out the issue here. A year ago, I was in the hospital due to some GI issues that brought me close to dying. I have been wondering how I would feel come this makeshift anniversary. Strangely enough, I am in the same mix of life as then. That said, I do see myself in a different place in the light of the many gifts since then: the gift of my first wedding anniversary; the gift of seeing Everything We Think We Hear printed as well as having The Book of Flight soar into the (e)world; the gift of doing poetry readings in my hometown again; the gift of having my family hear me read poems and share what I love; the gift of new projects and new friends. This makeshift anniversary has brought up complicated feelings to say the least. And yet, the feelings aren’t exactly unmanageable or strange. When I think of poets able to navigate this terrain of human fatefulness, Lucille Clifton comes readily to mind. In the poem below, Clifton describes “sorrows” through imagery that evokes a mix of angels and the duende. It’s exactly this mix of the living and the dying that poetry manages to bring to understanding one lyric at a time.